The TTB website has a helpful FAQ on when a wine is considered “produced” and, thus, ready for declaration – click here. Some wineries wait to declare all finished wines (defined as primary and/or malolactic fermentation has stopped and that remain un-bottled) as of December 31. If you have questions about when to declare a bulk wine, please confer with your Compliance officer, legal adviser or the TTB itself. All wine must be declared before bottling or blending with an already-declared wine. 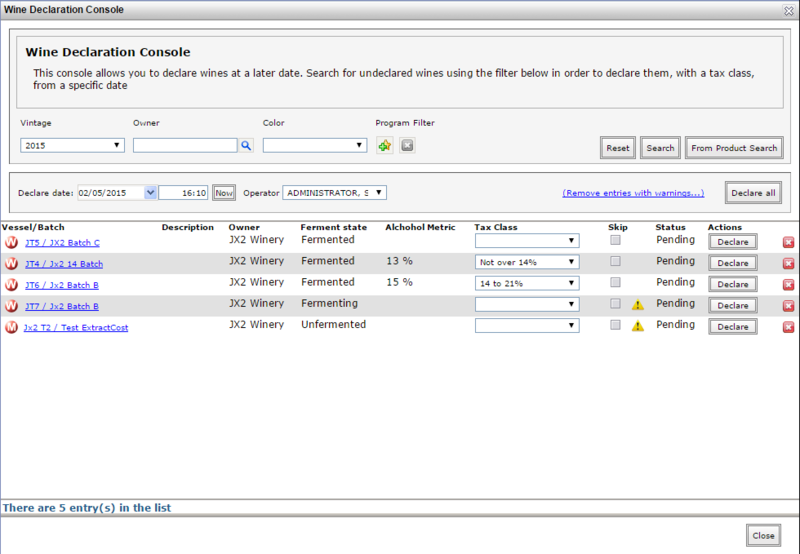 The Wine Declaration Console helps manage the declaration of fermented wines. It is intended for declaring multiple undeclared wines, all at once, from the one location in vintrace. The console can be found under Consoles > Declare Wine. We will cover each of the points in detail. Clicking Search will find your wines to add to the console. 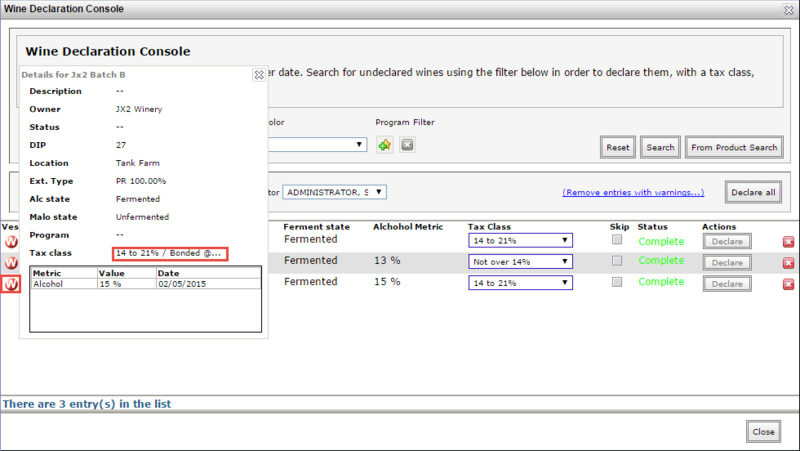 Use the Vintage, Owner, Colo(u)r and Program as filters to search for specific wines. Alternatively, you may load the wines by using the Product Search. Keep in mind that the console is intended for wines that are fermented and undeclared. Warnings will display in the console if you select inappropriate wines using the product search. A warning icon will show up for each of the inappropriate wines. In the example provided, two of the wines weren’t fermented and one of them was also a must. – Has already been declared. This will be the date used as the wine’s declared date. To declare wines with different dates you will need to group your wines with different searches. NOTE: The Declare wine console will default to the current date and time; if you don't want today's date, change it before processing. If the wine has metric readings, which satisfies a metric threshold policy, then the matching Tax class will be selected for that wine. Otherwise, you’ll need to manually select a Tax Class for the wine in order to declare it. Make sure the declare date and Tax class is set then click Declare for that wine. On successfully completing the declaration the status changes to Complete. This will declare each of the wines in the list (which are not completed already). Check that each of the wines has its tax class set and that you are satisfied with the declaration date and any warnings. You may remove those wine with warnings (as we do not recommend that you declare them until the reasons behind the warning has been resolved) by clicking on Remove entries with warnings. When you are satisfied with the wine entries, click on Declare all. A final confirmation will display before declaring the wines. If everything went smoothly, all of your selected wines will be declared. However if an error occurred part way through the declaration you can choose to skip the wine entry causing the problem. Click Declare all again, to run through the list from where it stopped. You would rollback the operation and start again. However, if you have performed too many complex operations between the “real” declaration date and the one you inadvertently used, then please contact vintrace Support. The first option is to record an Analysis of alcohol against the wine. Upon confirming the analysis you will be prompted with the tax class selection screen. Note: if you have turned off the declaration switch in your winery setup, this dialog box will not appear. Please click here for the article on using the Declaration console. The second option is to set up a Product Treatment in Winery Setup – Treatments – Treatment (Product). You can tick the change tax state which then allows you to set the tax class and the reason for change. You will need to create one Product treatment for each tax class and class change reason (Produced by fermentation is the most common). For the typical winery, most still wines will use the Not over 16% and 16% - 21% classes. Note: you have to set an option for both the tax class and the reason. You can then record this treatment on the wine you want to declare. Sometimes you want to declare a single wine; this is common when you are doing a rollback and discover that a wine was not declared prior to dispatch, etc. Rather than using the Declare wine console, it is very simple to declare a wine from the Product overview. Use your favorite search method to find the wine to be declared; open it in Product Overview. Click Tax information (Government building). If you have read about using the Declare wine console to mass declare wines, this is the same screen but with your chosen wine already populated. Notice that this will declare as of today's date unless you change it. Because there was a valid alcohol %, vintrace has pre-selected the correct tax class for you. Click Declare; the Status will change from Pending to Complete. When you close the Console and return to the Product overview, click Refresh (upper right corner). Notice the tax class and the bond under which this wine is declared is displayed. There are number of reasons that a wine can be declared accidentally with the incorrect tax class and/or the wrong bond (most commonly in a custom crush facility). The most common cause is the premature declaration of tax class and bond when prompted during a change in alcohol %. By default, vintrace prompts you to make a declaration when you add an alcohol value after press or when you stop the fermentation on a wine in alcoholic fermentation. Select “Ignore” to skip declaration; select “OK” to accept the declaration and “Cancel” to go back to your previous screen. 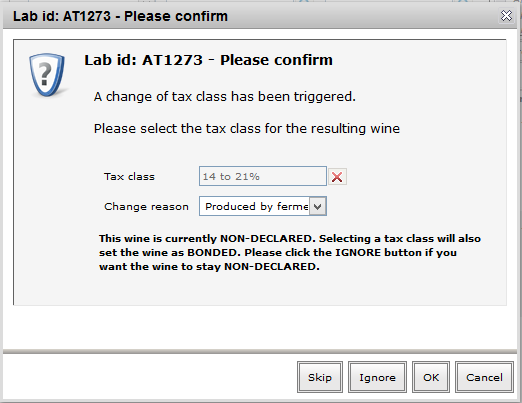 If you have a wine that was incorrectly declared, you can use the Rollback feature to achieve this. You will want to find the operation that caused the premature declaration and rollback at that point. If a rollback is not feasible due to the amount of work performed, contact support.